BEIRUT: Fiddling with mobile phones, chain smoking and sitting around: enforced idleness is the burden of almost every single resident in the Nahr al-Bared Palestinian refugee camp. Their abysmal situation is the focus of a new film, “A Sip of Coffee,” produced by a-films, an international anarchist film collective presently focusing its efforts on the camp. Those in the collective run film-making workshops within the camp in the hope of promoting film-making as a tool for political activism, a-films activist Ray Smith told The Daily Star. He produced with film along with novice film-maker Mohammad Eshtawi. Situated 16 kilometers North of Tripoli, Nahr al-Bared used to be a source of pride for its residents – with a thriving economy and bustling market attracting both Lebanese and Palestinian customers, it was the most prosperous of Lebanon’s 12 Palestinian refugee camps. 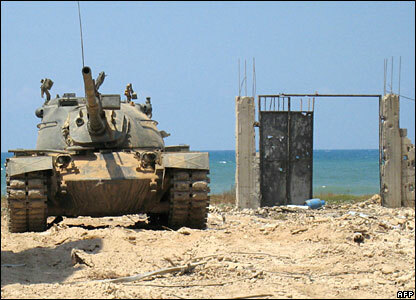 Its luck turned for the worst in 2007 when a militant Islamist group, Fatah al-Islam, sought refuge in the camp. A three-month battle between the group and the Lebanese Armed Forces, ending on September 2, resulted in the total annihilation of the camp. Nahr al-Bared’s Palestinian residents found themselves displaced for a second time in history, losing everything they had saved and built up over the last 60 years. Two years on from that devastating war, the camp has been partially cleared of rubble, but the people of Nahr al-Bared remain in limbo: living in temporary housing units as they wait for the reconstruction to begin. Nahr al-Bared’s once robust economy was destroyed along with the camp. “A Sip of Coffee” revolves around the testimonies of Mohammad, an unemployed camp resident in his twenties, and his father Ziyad. Through their voices, the 26-minute film illustrates the issues that matter most to Nahr al-Bared’s residents: unemployment, reconstruction, displacement and endless, stifling monotony. Mohammad has tried to get a job but there simply aren’t any. What work he can find is often casual day labor. Mohammad’s father Ziyad has also struggled to find work after losing his two shops in the camp’s siege. “After the destruction of Nahr al-Bared and its declaration as a military zone, the economy was reduced to point zero … the camp’s economy depended on the [Lebanese] residents of the Akkar region,” he tells the camera in a resigned voice. He now scrapes money together by fishing and running a makeshift cafe. Resentment is growing steadily among the camp’s residents as the many promises made to rebuild the destroyed camp falter. The stifling living conditions in the temporary housing units, oppressively hot in summer and freezing cold in winter, only aggravate their anger. “I’m sorry to say it, but we live in cow sheds,” Mohammad says. NGOs call the cramped iron and concrete structures temporary but they feel permanent to many of those struggling inside. “When my family and I gather in the evening, I hardly know where to sit – it’s very crowded,” Mohammad says. Ziyad shares his frustration. “The population density always causes problem between the families who aren’t used to each other,” he says. Ziyad, like many others, fear they will be displaced forever, and participate in protests urging the authorities to begin immediate reconstruction of the camp. “People rightfully feel that they’ve lost control over their lives, because their lives are being ‘managed’ by NGOs and UNRWA (the UN agency dedicated to providing assistance to Palestinian refugees), and because their movement is limited by the Army’s checkpoint and permit system,” said Smith. Although a ceremony was held this March to mark the beginning of reconstruction, nothing has happened since then. BEIRUT: Despite facing severe work restrictions, most Palestinian refugee households have at least one family member who is employed, constitute 10 per cent of all private consumption in Lebanon, and do not burden the Lebanese welfare system, a recent report has found. The Najdeh (Welfare) Association, a Palestinian nongovernmental organization (NGO), published the report examining the contributions of Palestinian refugees to the Lebanese economy in January with funding from aid agencies Diakonia and Christian Aid, as part of its “right to work” campaign. Under Lebanese law, Palestinian refugees are barred from all but the most menial occupations. Nonetheless, the report found one third of the individuals sampled worked, 91.1 of households had a member who worked, and roughly 40 per cent were searching for work. Only 1.7 per cent of those surveyed had work permits, a fact the report said “renders the Palestinian refugee labor force invisible in official statistics” and exacerbates their socioeconomic marginalization. Najdeh also found there was “disequilibrium in the contribution to the workforce among men and women typical to the region: women constitute only 20 per cent of those who work between ages 15 to 64 years.” No change to this disequilibrium had occurred since a similar report was published a decade ago, the report said. Most men, meanwhile, worked when they were younger, between the ages of 25 and 29, and 35-39, in keeping with their time-honored gender role as breadwinner. However, significantly more men of working age were illiterate compared to their women counterparts. “This phenomenon may be considered a crude indicator of school dropouts,” Najdeh said. Most Palestinian men and women worked in the private service sector, with men working predominantly in construction, industry, transport and agriculture. More women, meanwhile, were employed in the NGO sector or by the United Nations Relief and Works Agency for Palestinian Refugees in the Near East (UNRWA). Because of “limited work opportunities for Palestinian refugees outside” their camps, most of the men and women surveyed were found to work within or on the peripheries of the camps. Perhaps surprisingly, the report found that a greater proportion (67 per cent) of employed women worked full-time, compared to 62 per cent of men, who more often engaged “in seasonal, occasional and other work patterns.” Furthermore, more employed women (48.6 per cent) were employed by an establishment, whereas 49.6 per cent of men worked for an “individual employer.” Men were also more likely to stop working due to health problems. Most men (59.6 per cent) and women (55.1 per cent) said they were “somewhat satisfied” with their current work environment, but “twice the proportion of women express being ‘very satisfied’ with health and safety conditions at work” compared to men (21.7 and 10.8 per cent respectively). This may be because more men engage in occupations with greater safety hazards, stated the report. The majority of both men and women expressed dissatisfaction with their low income levels, the report added. Median monthly wages were $260-266 for men and $188-200 for women. An overwhelming majority (84 per cent) of Palestinian households furthermore believed there were no work prospects for their children in Lebanon, a perspective perhaps compounded by the fact the median monthly household income of Palestinian refugees had declined from $260-266.7 in 2007 to $108-112 “during the first half of 2008.” In addition, 54.9 per cent of households said they were supported financially by remittances from emigrant family members. Although Palestinian refugees cannot legally contribute much to the Lebanese economy through employment, the sheer amount of them living in the country (more than 400,000) means they count for 10 per cent ($352 million) of all private consumption in Lebanon. Food, healthcare and rent constitute their top spending priorities. The report also found that despite a 60-year presence in Lebanon and extreme vulnerability as a group, Palestinian refugees “do not appear to have constituted a burden on the safety net system provided by the Lebanese welfare system.” The report stated UNRWA, NGOs and faith-based organizations represented the primary safety net for the Palestinian refugee community. Palestinians also contributed to “invigorating” the areas surrounding their camps by creating low-cost markets for low-income and other marginalized communities in Lebanon. The “Sabra, Ein el-Hilweh and Nahr al-Bared camp markets are recognized as major informal economic hubs for the poor,” said the report, adding that the destruction of Nahr al-Bared during the battles of 2007 had “resulted in a gap in the Akkar” region in northern Lebanon for such communities. Concluding the report, Najdeh spoke of the importance of granting Palestinian refugees the right to work and called for “implementing a formal economic strategic partnership between the Lebanese economic community and the Palestinian refugee economic community.” Najdeh also recommended allowing highly trained professionals to work in the Lebanese market “when needed,” and forming a dialogue committee between the Lebanese and Palestinian economic communities. “This would enable Palestinian refugees to work more effectively toward their own welfare and the development of the country hosting them,” said the report.